Firefighting is a physically demanding and inherently dangerous occupation. Firefighters are tactical athletes who must be fit to save lives and property. They must be able to move their own body weight, along with the weight of their turnout gear, SCBA, tools, charged hoselines, or an injured victim. This places stressful demands on their strength, stability, stamina, and mental well-being. The purpose of this program is to help Air Force firefighters achieve a level of conditioning required to safely and effectively perform time-critical tasks on the fireground. The U.S. Air Force is implementing the Air Force Firefighter Fitness and Wellness program to minimize firefighter injuries and maximize firefighter performance. 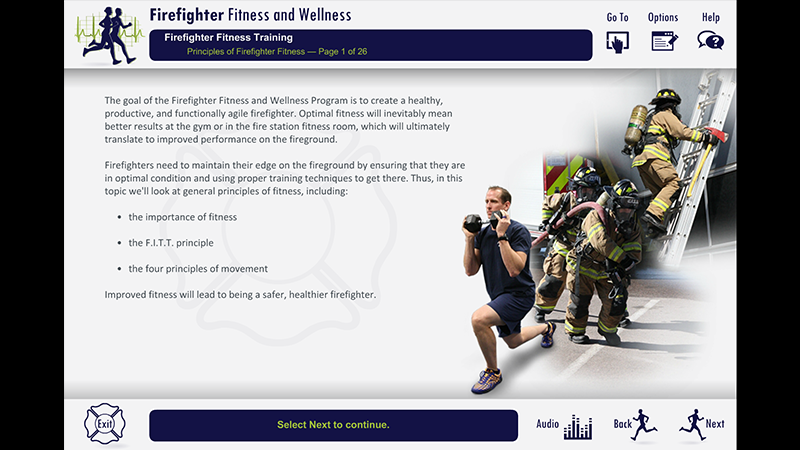 The Program consists of a firefighter fitness web-based training program, an occupational assessment, and a firefighter-focused wellness component. 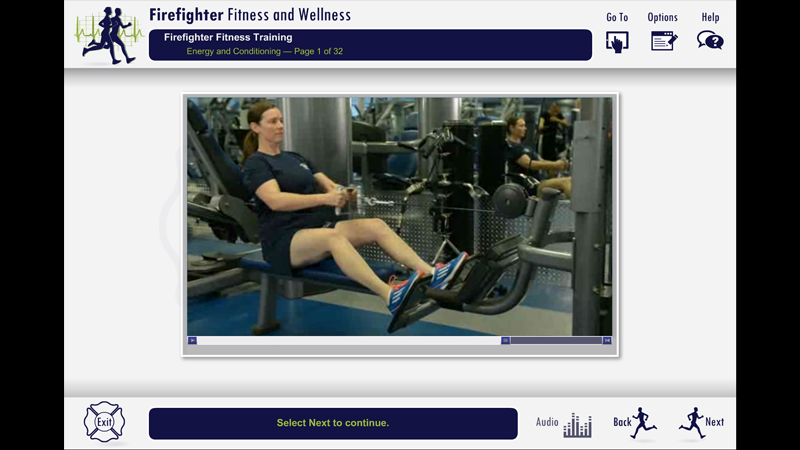 To meet the knowledge-based component of this initiative, PowerTrain developed the Firefighter Fitness and Wellness multimedia web-based training course. This course meets the most current standards set forth by the U.S. Air Force as well as health and safety standards defined in National Fire Protection Agency (NFPA) Standard 1500, Standard on Fire Department Occupational Safety and Health Program. 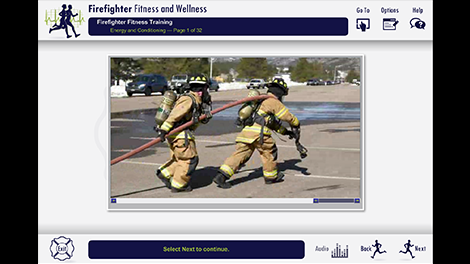 The Firefighter Fitness and Wellness web-based course provides 10-12 hours of knowledge-based training for Air Force firefighters. 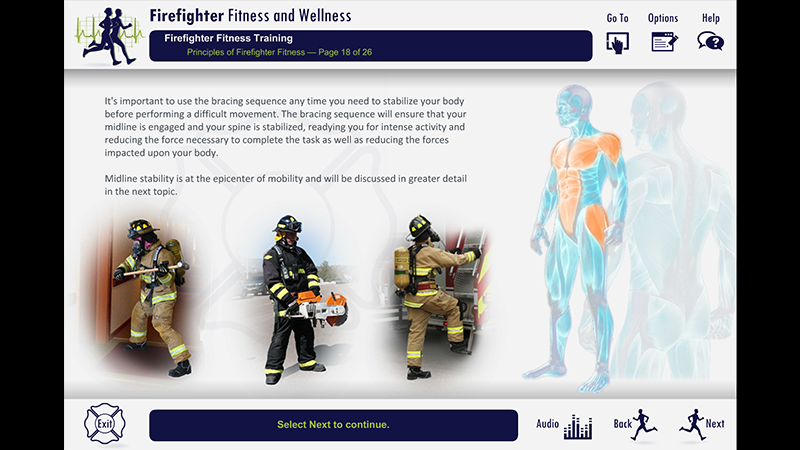 It promotes physical fitness and a physically active lifestyle that is scientifically proven to have a positive influence on job performance and general health; it covers the equipment required, setup, and instruction for running the Firefighter Occupational Assessment administered by the Air Force; and it addresses important components of mental and physical health, such as nutrition and stress-reduction strategies. The award-winning course meets the stringent Department of Defense (DoD) certification requirements and is SCORM-conformant. It is hosted on the on the Air Force Civil Engineer Center’s (AFCEC) Total Force Virtual Learning Center (TF-VLC) LMS. The Firefighter Fitness and Wellness course serves as the new foundation of training for the Air Force’s 11,520 firefighters.